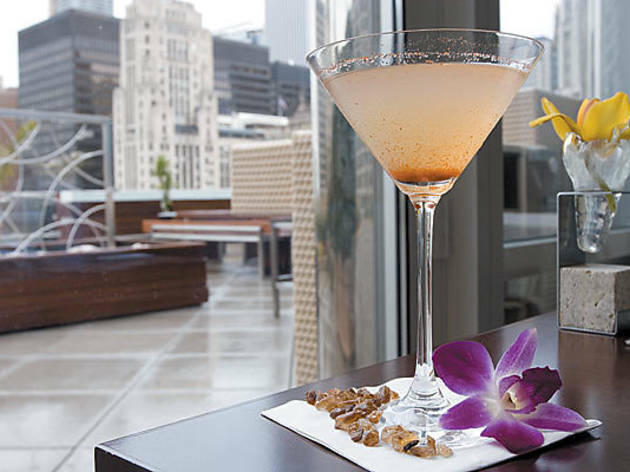 When the view of the Wrigley Building gets boring (it does happen occasionally), this drink steps in with a mesmerizing view: Cayenne pepper flakes float through the Grand Traverse cherry vodka and fresh sour, creating what amounts to a spicy, drinkable snow globe. For this spicy tipple (inspired by a drink at California’s Lark Creek Inn), a mix of Herradura Silver and reposado tequilas gets infused with pineapple, serrano peppers and tarragon. But don’t let those peppers fool you: They don’t do a thing to prevent this drink from going down smoothly. 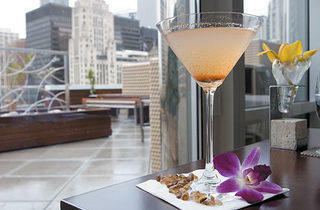 Where Indian and Mexican cuisines are combined, heat follows—even in the cocktails. With this liquid translation of an Indian street snack, garam masala and coriander are combined with mint, lime, tequila and a garnish of a crispy chaat cracker dabbed with tamarind chutney. Bar manager Sam Short admits his summer menu pickle-tini, with its base of dill-pickle brine infused with jalapeños, thyme and coriander, isn’t for everyone. But while his twist on a dirty martini is definitely pungent, it’s subtle, too: The back-of-the-tongue heat sneaks up on you slowly. Contrary to what its name suggests, you won’t find chicken or peanuts in this cocktail. Instead, you’ll get orange vodka, peach schnapps, clove syrup, mango and peach nectars—and the delicate heat that comes with the chile-powder-dipped mango garnish. • More "The hit list"